Enjoying the awesome fall produce right now doesn’t mean we have to cook it to death in order to enjoy it. After all of the hearty, piping hot soups and breads lingering around this season, sometimes we just need a salad. Something crisp, something green, something light. But it must be filling, or what’s the point? Sweet and tangy, this salad highlights fall’s pears and apples, along with the saltiness of a sharp cheddar. Dress with a light dressing, like poppyseed, for a filling lunch. 1. Wash the greens, chop the fruit and cheese into bite-sized pieces, and layer all on a plate. 2. Top with poppyseed dressing for a little sweetness. Do you ever come up with a dish based on someone else’s title? It sounded really good, really filling, really healthy. 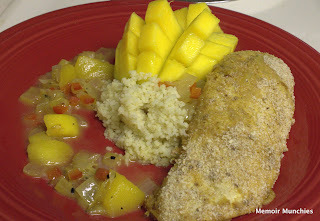 And we had chicken, mangos and couscous…why not? But that’s as far as I got with the recipe from Eating Well. I noticed that the chicken was glazed in a mango chutney and closed the computer. It was time to get creative, even if it isn’t the most authentic curried chicken on the planet. The results? 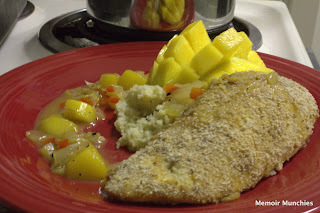 One of Matt’s favorite meals that I’ve made. Surprisingly good. Hope you can use this beautiful, sweet mango fruit in your next dinner! Preheat oven to 375. In a saute pan on medium-high, heat the oil and then add the onion and 1/4 teaspoon of red pepper flakes. Let heat for 1 minute, or until flakes are toasted. Then, add the red bell pepper and salt and pepper. Cook for 3 minutes. 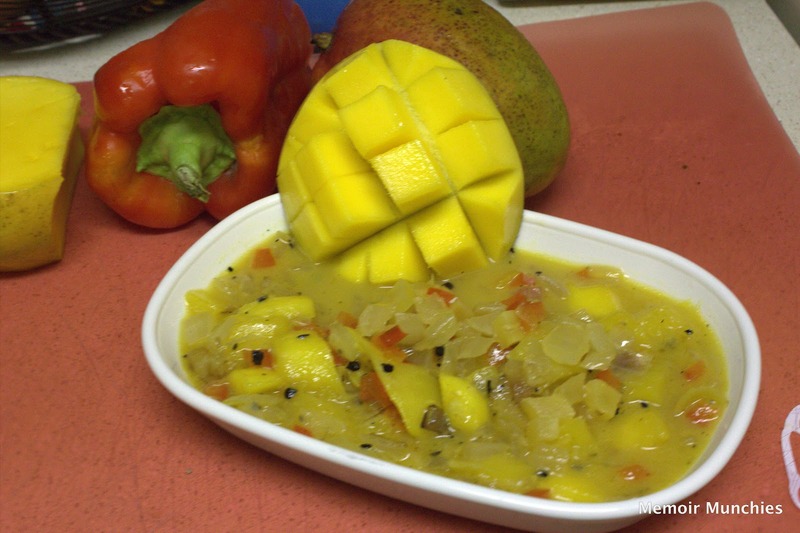 Then add juice and mango slices, and reduce to medium heat, letting cook for 10 minutes. In the meantime, mix the honey mustard, 1/8 t. red pepper flakes and curry powder in a small bowl. In a second small bowl, pour the breadcrumbs (or other coating). 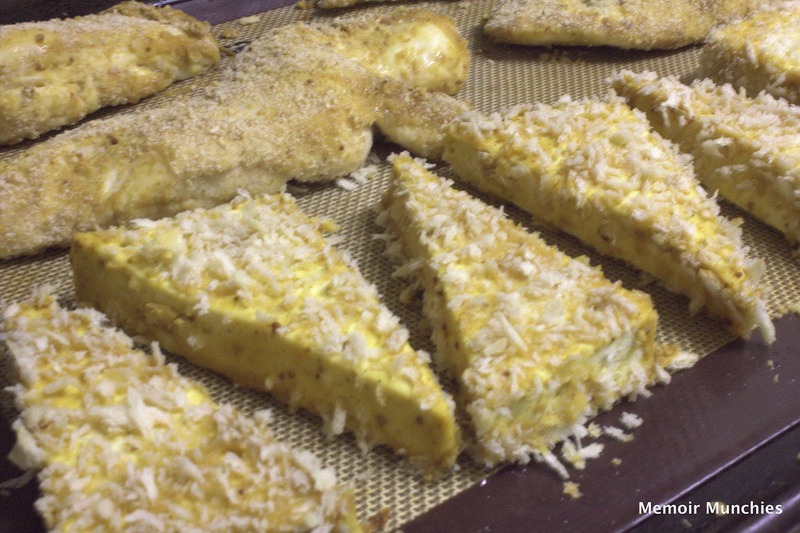 Dipping the chicken in the mustard mix, roll it in the breadcrumbs and place on a lined baking sheet (use foil with cooking spray or parchment paper). Boil 1 1/2 cups of water in a pot. Once the water is boiling, immediately remove the pot from the stove and add 1 cup of couscous and let sit for 5 minutes. Fluff couscous with a fork, and add a dash of salt and pepper. Step Four: Add couscous or rice to a plate and place the chicken on top. Drizzle with mango chutney and serve sliced mango “ball” on the side (see photo below). Sprinkle raw mango with chopped mint. Eat. Be merry. 1) Slice one side of the mango. 2) Holding the slice in your palm, slice vertical and horizontal lines into the mango, without cutting through the skin (and cutting your hand!). 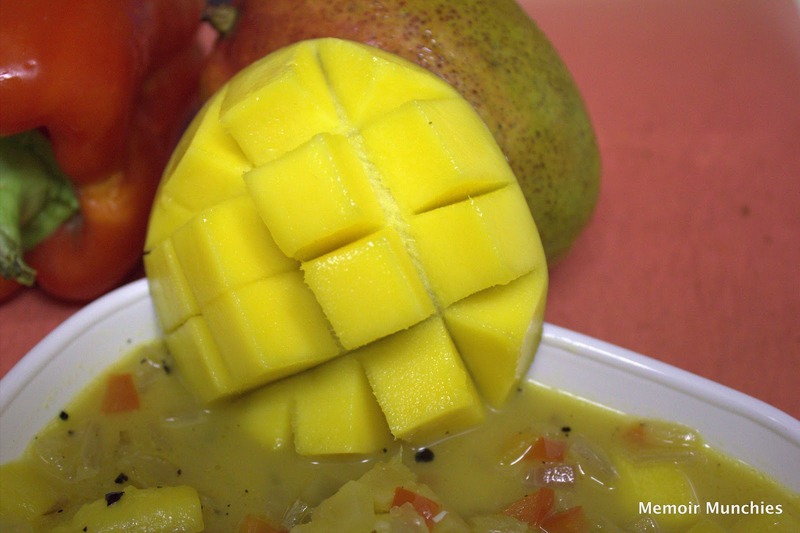 3) After cutting, turn the mango inside out…voila!